Sometimes a pet selects you – or perhaps your home – and moves in. 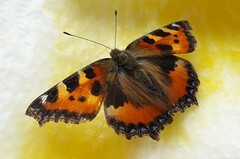 In my case, I have been adopted by a small tortoiseshell butterfly (Aglais urticae). When it arrived last week I did the normal thing and opened the window, trying to shoo the little thing out. It refused. I tried harder. 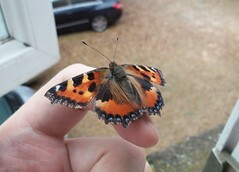 I caught it on my hand and tried to wave it out: I have never experienced a butterfly holding on for dear life like that. It very clearly did not want to fly off into the rainy cold of British autumn. So I relented and let it stay. I call it Kim, since I cannot tell whether it is a male or female. It seems to only have four legs. Yes, I know this is probably the gayest possible pet. Over the past days I have occasionally opened the window when it has been fluttering against it, but it has always quickly settled down on the windowsill when it felt the open air. It is likely planning to hibernate in my flat. 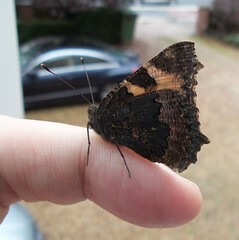 This poses an interesting ethical problem: I know that if it hibernates at my home it will likely not survive, since the environment is far too warm and dry for it. Yet it looks like it is making a deliberate decision to stay. In the case of a human I would have tried to inform them of the problems with their choice, but then would generally have accepted their decision under informed consent (well, maybe not letting they live in my home, but you get the idea, dear reader). But butterflies have just a few hundred thousand neurons: they do not ‘know’ many things. Their behaviour is largely preprogrammed instincts with little flexibility. So there is not any choice to be respected, just behaviour. I am a superintelligence relative to Kim, and I know what would be best for it. I ought to overcome my anthropomorphising of its behaviour and release it in the wild. Yet if I buy this argument, what value does Kim have? Kim’s “life projects” are simple programs that do not have much freedom (beyond some chaotic behaviour) or complexity. So what does it matter whether they will fail? It might matter in regards to me: I might show the virtue of compassion by making the gesture of saving it – except that it is not clear that it matters whether I do it by letting it out or feeding it orange juice. I might be benefiting in an abstract way from the aesthetic or intellectual pleasure from this tricky encounter – indeed, by blogging about it I am turning a simple butterfly life into something far beyond itself. Another approach is of course to consider pain or other forms of suffering. Maybe insect welfare does matter (I sincerely hope it does not, since it would turn Earth into a hell-world). But again either choice is problematic: outside Kim would likely become bird- or spider-food, or die from exposure. Inside it will likely die from failed hibernation. In terms of suffering both seem about likely bad. If I was more pessimistic I might consider that killing Kim painlessly might be the right course of action. But while I do think we should minimize unnecessary suffering I suspect – given the structure of the insect nervous system – that there is not much integrated experience going on there. Pain, quite likely, but not much phenomenology. So where does this leave me? I cannot defend any particular line of action. So I just fall back on a behavioural program myself, the pet program – adopting individuals of other species, no doubt based on overly generalized child-rearing routines (which historically turned out to be a great boon to our species through domestication). I will give it fruit juice until it hibernates, and hope for the best. Thanks for this post. I’ve read many of yours and had never commented before now. F’s suggestion sounds most plausible!